The act of giving thanks is among the most fundamental acts of love. It lies at the very heart of worship – in which, in the words of Archimandrite Zacharias of Essex, there is an exchange. In giving thanks we make an offering which itself is always inferior to what we have received – but which is itself an enlargement of the human heart. To live rightly in the presence and communion of God is to live in a state of constant thanksgiving. For from Him we receive all that we have – our life and existence, all good things, the hope of redemption, and the joy of communion. The offering of thanksgiving is the acknowledgment within our heart that we ourselves are not the author of any of these things, but are rather the recipients – those who receive gifts from God. “Glory to God for All Things”! Indeed! I was thinking of what might be appropriate to read… before praying Thursday over the meal with our extended, Protestant family. And right here you have written some wonderful eucharistic thoughts that I will use beforehand. Thank you good God for your right timing! Glory to God for all things! You can take the sun to the other side of the “empire”, but it will still shine a bright light. What a gift to humanity is St John Chrysostom… So is the practice of thankfulness the same as prayer: one must practice it constantly to obtain it? If we have broken our communion with God and have relegated Him to a second storey (heaven up there somewhere), then remembering to give thanks to Him occasionally or only for the good things will not restore communion. I want to be thankful for all the problems in my life, but I am not naturally – it is hard work! Like prayer; sometimes I’d rather be doing anything else. Lord forgive me. Thomas, your query about the practice of thankfulness being the same as prayer: i suppose so. Thank you Father Stephen for writing this blog. Glory to God for all things! Glory to God for All Things, including your Wonderful Words of Wisdom. You are a beacon of light in this dark,dark world. God Bless and Keep You Fr. Stephen! The discipline of giving thanks is like a rule of prayer. At least initially one has the find one or two things each day and then build from there. It is never solely an emotion. As I practice it I find it often leads into repentance. I am not good at it. It is much easier for me to not be thankful even in some rather obvious situations. I have been practicing the writing of a ‘gratitude list,’ as advised or requested of all parishioners by my (OCA) parish’s priest, only this year, but it has made a tremendous difference in my feelings of gratitude. It was embarrassing at first, to see that my thankfulness before God is not about flattering things, not what I wish I were thankful for, but that reluctance to be vulnerable faded quickly. I don’t do it as often as I should (daily is the ideal), but it’s always fun to do, and surprising what I end up writing down. In a funny way, my gratitude lists pair with my written lists of sins to bring to confession. I can sometimes see connections between the two kinds of lists, or at least common themes, indicating that gratitude is necessary to simply know how we feel and who we are as Christians. Fr. Stephen’s writing on this topic has inspired me to express gratitude for people even when we don’t get along. I like having this way to remind myself of Providence’s goodness, to anchor my relationships in humility and awareness of God’s activity and Presence. Gratitude reliably makes life’s struggles much easier to bear, while ingratitude seems to me to be connected to acedia, or weariness of heart. Gratitude energizes a person to make use of his talents, to not bury what is appreciated. When I had acedia, I remember that practicing gratitude initially removed “scales” from my heart. I suspect that another virtue sometimes discussed here, forgiveness, is paired with gratitude, so that they develop together. In a sense, gratitude is the opposite of anger (as one involves sweet acceptance, and the other, bitter rejection), so there is a conflict between enjoying our experiences and being offended by them. This might have relevance to contemporary psychotherapy methods. I imagine that gratitude can help to resolve bitter feelings. I have learned to feel grateful to those asking for alms on the street, as I always feel blessed to meet them, and somehow, my experience of my body feels better after I make a donation. I do not know if they choose to pray for me, but their gratitude warms my heart, and is well worth the price (which they deserve regardless). St. Nicholai (Velimirovich) wrote once in a letter (collected in a book of his letters) to a former barkeeper who had lost his business and turned to begging in front of the bar he formerly owned, that now, begging was this man’s legitimate profession, so he should have no shame about it, and rather, gratitude that God has blessed him with the right circumstances to be sober and wise. Holy wisdom allowed St. Nicholai to appreciate this impoverished man, and to bless his good work. Father…that photo of the Cup being upheld by Fr. Schmemann (of blessed memory) is, how can I say…seriously intense. I could not help but be captured by it…I found myself gazing at his face, fixed on his eyes, as he holds the Chalice. I don’t know how to describe it…he is there but his eyes show he is somewhere else. I am sure what I see and can not describe is not a forced response but a reflection of his knowing that the center-point of the Liturgy is the Eucharist…that he is holding the precious Body and Blood of Christ…where he, as a Priest, by the grace of God, mediates between the Center-point and the congregation, the One Who offers and is offered. It is the Cup that is attended to…not him. It is an awesome moment. Timeless. Yet the whole picture, including him, is striking. Thank you for posting it. We have so much in Christ to be thankful for! Everything about Him is ‘intensely serious’…awesome and wonderful. A blessed Thanksgiving to you Father. Glory to God for all things…Lord, teach me to pray rightly. Thank you Father Stephen for shining light along the way. Thank God for your work and words Fr Stephen! Being grateful for all things God gives us is indeed Life. Thank You, O Lord, for the sufferings You bestowed upon us, for they are purifying us from selfishness and reminding us of the “one thing needed;” Your eternal Kingdom. Lord, it is good to be here! Amen! I’m ever grateful for our parish priest at St Herman’s as well who shared these and other great pearls of wisdom. Our priest reads the homily that Dee shared everything Thanksgiving. It turns me into a crying mess. 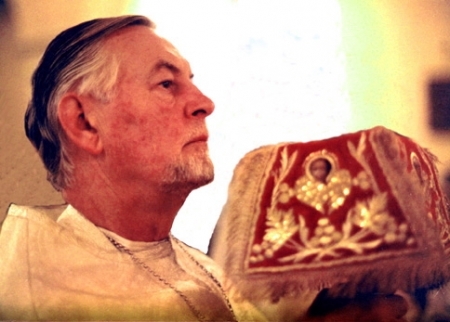 Thank you for the presence of Fr Protopresbytre Alexandre Schmemann, (who had awakened in me an ineradicable faith), who inspires us this force of life, this depth, this unfailing testimony …. Yes, Glory to God for everything! Beautiful words, Father Stephen, thank you! As an immigrant, Thanksgiving has always been my favorite American holiday, one I greatly missed whenever I was absent this country. And Ivan, what a wonderful thought – to thank and ask for prayer of those less fortunate! It is so hard to be a recipient – but this is a gift they can give also – thank you! Oh, God our Father, you are deserving of all this and more. Thank you for giving these words, this eloquence that is in honor of you, to your servant, Fr. Stephen. Glory to you, oh God our Father, glory to you. I haven’t visited in a few months but am so glad to see this post. I have to work on the cub scouts ‘duty to God’ task with my son and have hoped to talk about Thanksgiving with him as the major element. I hope to have him read this as well.